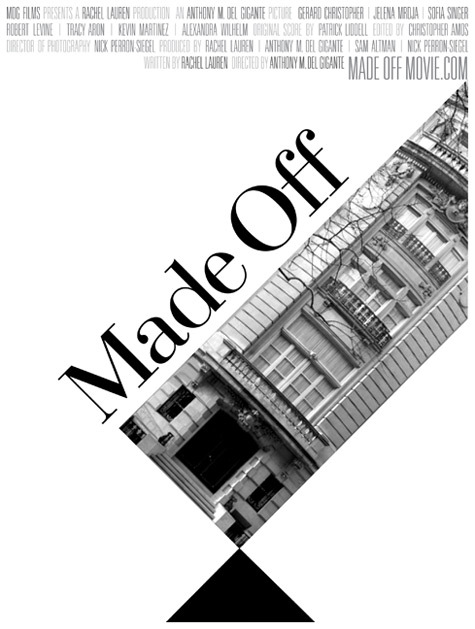 MDG Films Proudly Presents "Made Off"
The Manhattan Film Festival recently named the short film Made Off among its 2011 official selections. An MDG Film, Made Off tells the story of the father of an affluent New York City family swindled by Bernie Madoff who uses his youngest daughter to pull off his own white-collar crime. The drama is the collaborative effort of Northwestern University students Anthony Del Gigante (Director, Producer) and Rachel Lauren Goldman (Writer, Producer). Made Off is one of only 132 films selected for screening from thousands of submissions from around the world. Made Off stars Gerard Christopher from the internationally syndicated series, The Adventures of Superboy, as well as Jelena Mrdja from the film, Here and There (2009 TriBeCa Film Festival winner), and Sofia Singer, making her acting debut. Purchase tickets. View the Made Off movie trailer.